Guess Who’s Reissuing Wolf Parade’s Classic 1st Album ‘Apologies to the Queen Mary’ on 3xLP? Yeah, it’s us! Sub Pop will release Wolf Parade’s Apologies to the Queen Mary: Deluxe Edition, a reissue of the group’s acclaimed first album, worldwide on 3xLP/DL May 13th. The reissue features the original album, now as a double LP, along with the band’s pre-Sub Pop, self-titled EPs (released in 2003 and 2004), both of which are making their vinyl debut. The package features new artwork and includes the previously unreleased track “Snakes on the Ladder” from the Apologies… sessions. (There will also be a cassette version of the remastered original album (without bonus tracks) available on May 13th.) The album was remastered for this release by the band’s longtime associate Harris Newman at Grey Market Mastering. The reissue of Apologies to the Queen Mary: Deluxe Edition comes on the heels of Wolf Parade’s recently-announced 2016 reunion. New to Wolf Parade? We made this handy Beginner’s Guide playlist just for you! Apologies to the Queen Mary: Deluxe Edition is now available for preorder at Sub Pop Mega Mart, Wolf Parade.com, Amazon and Bandcamp. 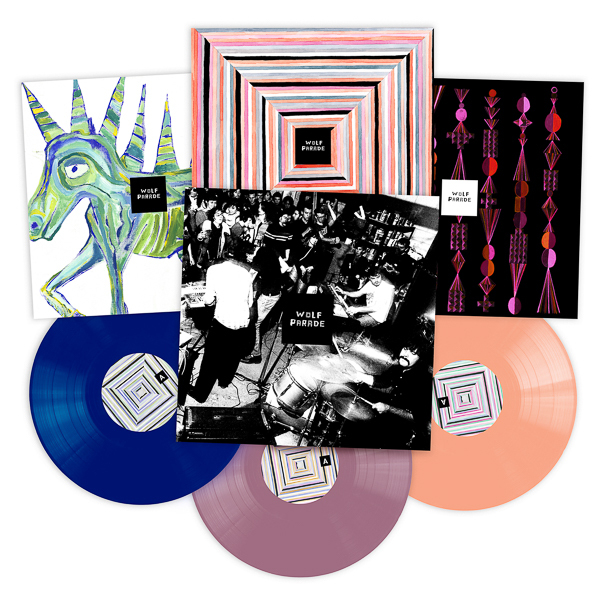 The limited Loser Edition 3xLP set will come on pink, blue, and peach-colored vinyl, and is now available to pre-order at megamart.subpop.com, the band’s web store and at select independent record stores (while supplies last). Wolf Parade – Spencer Krug, Dan Boeckner, Arlen Thompson, and Dante DeCaro – formed in Montreal in 2003. After the aforementioned self-titled EPs, the group released Apologies to the Queen Mary to much acclaim in September 2005, on Sub Pop. The album was recorded by Modest Mouse frontman Isaac Brock and engineer Chris Chandler at Audible Alchemy in Portland, Oregon. The album was an entirely collaborative effort, barreling headfirst and breathlessly through songs written during Wolf Parade’s early years together as a band. The album has sold over 100,000 in the U.S. alone. Ticket links can be found right over here.